​Jensen Precision Machining, Inc. has a very unique history. The company was ‘born’ from a well-known entity in the computer industry, called Iomega. Iomega was founded in 1980 and located in the town of Roy, Utah a community about 35 miles north of Salt Lake City. Iomega was for many years, a significant name in the data storage industry. Their most famous product, the Zip Drive, was revolutionary as it offered large amounts of storage on easily portable compact cartridges. The original Zip disk’s 100MB capacity was a huge improvement over the 1.44MB limitation of floppy disks. ​Jeff Jensen was one of the many great machinists employed by Iomega, which at its height employed more than 3500 people. When the company closed its Utah operations, they offered Jeff the opportunity to purchase the machine shop. And so Jensen Precision opened for business in 2006, nearly a decade ago. ​Though Jensen Precision was initially formed to support Iomega, as life often turns out, their work with Iomega was short lived. This wasn’t an issue for the new company, as Jensen Precision’s reputation was quickly established with companies in the aerospace, defense and medical industries. In fact, their quality of manufactured parts is so superior that nearly 40% of their work today comes from medical manufacturing companies. They offer CNC and manual machining, sheet metal punch and brake, mold making, injection molding, EDM machining, heat treating and laser engraving, all in-house. ​When you consistently deliver quality parts on time, it isn’t all that surprising that your business will grow. Jensen Precision not only is adding new team members, but they are expanding their facility. 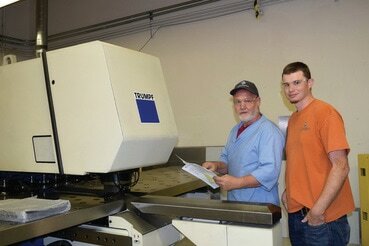 The most recent expansion offers them 25% more floor space, which facilitated new machine tool purchases. Not long ago, the company purchased two new 4-axis CNC machining centers, a Mitsubishi EDM machine, and a Universal Laser Systems Engraver. They also have a Brown & Sharp CMM for inspection, two 3-axis CNC machining centers, CNC lathe, four Bridgeport EZ-Traks, two manual lathes, Trumpf CNC punch and Wysong precision brake, as well as heat treating capabilities to support their customers’ fabrication requirements. Jade says, “We still have some old school manual machines, which we are able to utilize today because we have such skilled Journeymen machinists. We knew that we could increase our productivity with newer equipment.” He continued, “As an example, our saw was a 25+ year old manual. It still works, and we continue to use it today, but we invested in a state-of-the-art Marvel/Spartan Series PA260EPC saw. This saw is amazing – with our older technology; we had to leave 1/8” extra on the part to clean up both edges. With our new Marvel/Spartan Series saw, we have less waste. The rigid double column horizontal design allows for straighter and more accurate cuts. We can set up the machine to cut parts at different lengths unattended on the same bar. Set up is easy with the automatic material height setting and easy programming. Where it took 15 minutes to cut a bar with our old saw, we can now do the same cut in 1/3 the time with our Marvel/Spartan Series saw. Buying the Marvel/Spartan Series PA260EPC wasn’t a difficult decision to make.” Jade says that machine shops in the area call on Jensen Precision specifically to cut their raw stock with Jensen’s Marvel/Spartan Series saw. Jade and Jeff don’t know ‘banker’ business hours – for them, it is ‘do whatever it takes’ to deliver quality parts on time. They are family members, and after running the shop by day, they regularly work on bids in the evenings and weekends.